“Taipei, Taiwan (Chinese Taipei) – The International Council of Societies of Industrial Design (Icsid) announced today that the City of Cape Town (South Africa) has been designated the World Capital Design (WDC) 2014. Cape Town is the fourth city to hold this biennial appointment and marks the first for the African continent”. Cape Town ran an exceptional campaign. They began their campaign very early, they devised a visual identity that was very strong (in black and yellow) and they consistently and in a single-minded way applied that identity everywhere … and it was displayed on thousands of websites (17,500+ when I last checked). Capetonians in general gave their unreserved and enthusiastic support for the bid – the theme of which was a very accessible and usable “Live Design. Transform Life”. 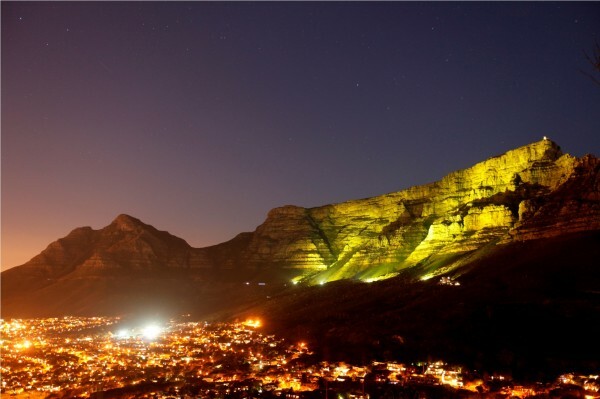 The enduring image of the WDC 2014 Bid Campaign is Cape Town’s Table Mountain illuminated in yellow on the evening of the Icsid Jury visit. Congratulations and well done to all involved – great success in 2014. There are two winners from this campaign – Cape Town and The International Council of Societies of Industrial Design (Icsid) who ran an exceptionally professional project and kept the World Design Capital brand on track. This brand is not just important to Icsid, and not just important to Cape Town and the previously designated Turin (2008), Seoul (2010) and Helsinki (2012) – it helps change the way city inhabitants and city administrators around the world view and understand their environment and how it can be improved. Congratulations to the members of Dublin’s bid team for getting as far as they did against enormous odds. Aiming to achieve World Design Capital status for Dublin by 2014 was big ask, as highlighted in the occasional comments we saw about the bid in the media. Having returned to live in Dublin after two decades based in Brussels and travelling throughout Europe and beyond, I find myself constantly ranting about how dysfunctional Dublin is as an object of system design, and how the aesthetic of its built environment has, if anything, become even more derivatively British provincial with each passing year. It’s as if the last century of cultural and political independence had been largely wasted. Consequently the bid for Design Capital status had to build on an “insider” segment of the design spectrum, highlighting newer aspects of design, and there was little evidence of wider public engagement in the bid. So, even if the bid had been successful, there was a risk that achievement of the Design Capital title would have remained something for only insiders to celebrate, and for it to have been largely an end in itself. When I first heard of the campaign from Garrett, my reaction was that it would be better to aim for eight or ten years hence, and to use this interval to mobilise a much wider buy-in from individuals, firms and institutions in Dublin, and make the trajectory from design no-go area to pro-design city part of the narrative underpinning the bid. In fairness to him, I think he shared this view, and in the event, broad public buy-in seems to have been a decisive aspect of Capetown’s bid. Is it still an option to mount a new, broader-based campaign with a decade-long a timescale, and to use this to build on what has been achieved to date rather than let the effort peter out?